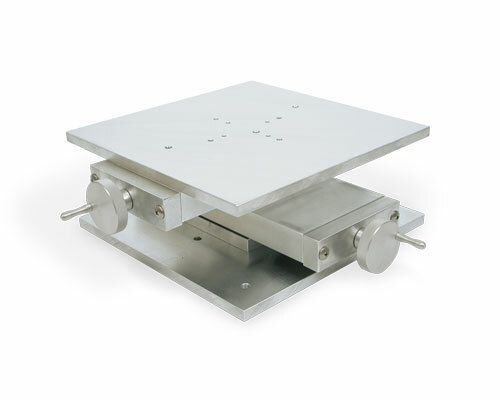 Velmex offers several pre-assembled UniSlide XY Tables to address customer requirements for indexing, scanning, fixturing, positioning and gauging. These Tables are designed using the proven UniSlide Linear Stages as a base. They are available in manual and motorized configurations. 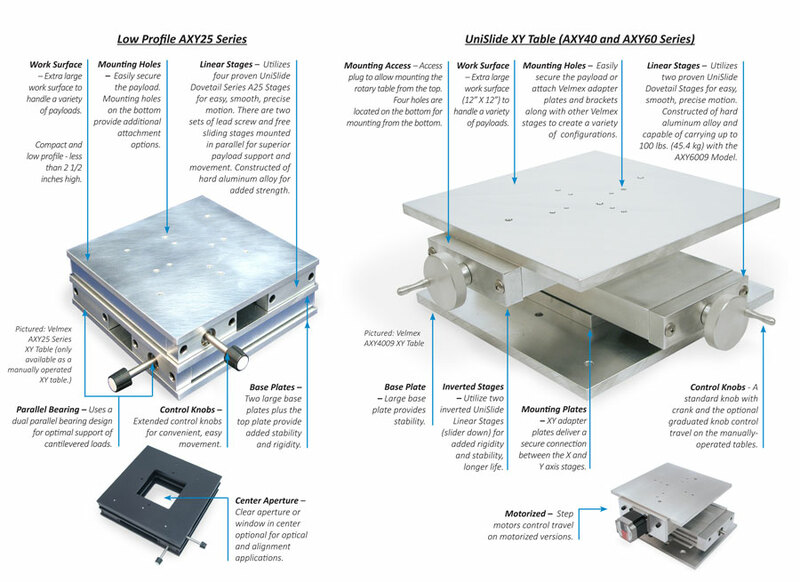 The large UniSlide XY Tables, Manual Series AXY40 and AXY60 and motorized Series MAXY40 and MAXY60 are designed with two A40 or A60 Linear UniSlide Assemblies or two MA40 or MA60 Assemblies, respectively, crossed and inverted with the carriages down for a more stable base. 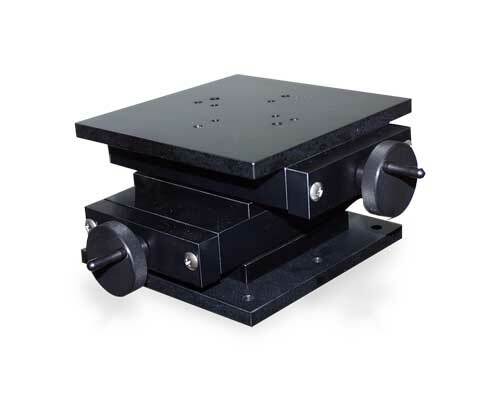 The tables also incorporate a large base for additional stability, two adapter plates to connect the X and Y axis slides, and an extra large work surface. 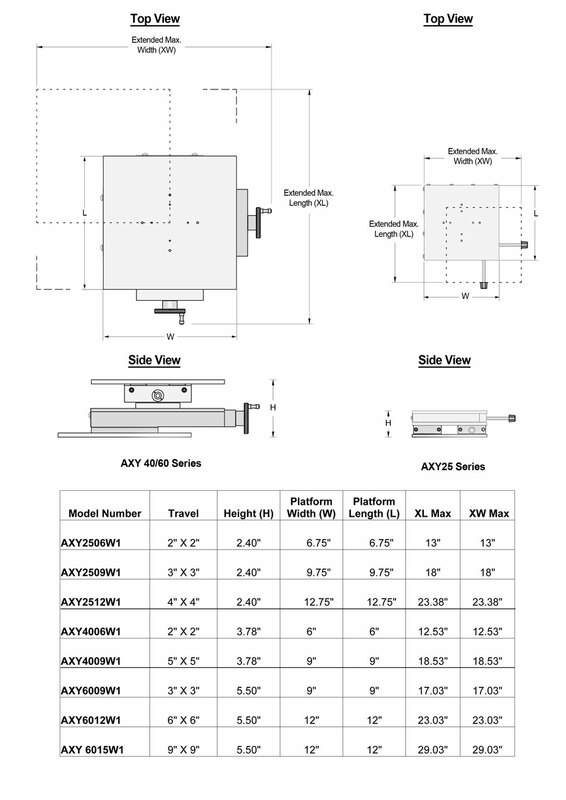 The lower profile and manual only AXY25 series is designed utilizing four linear A25 UniSlide Assemblies, two working in tandem to provide smooth movement in each direction. Virtually self-contained this table features a height of under 2 1/2 inches and delivers optimal rigidity and support for cantilevered loads. 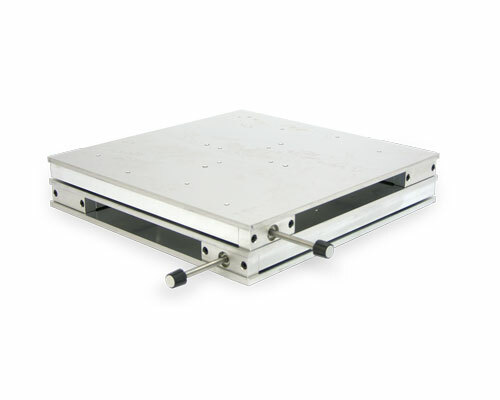 All Velmex linear manual or motorized stages can also be combined in numerous XY configurations and, with the addition of adapter plates, used as an XY table. AXY25 Series – Three low profile models with a travel range of up to 4" by 4" (10.2 cm x 10.2 cm). These models feature an unobstructed work platform. The models in this series can be purchased with or without a center window / aperture. Standard lead screw advance is 0.100"/revolution. AXY40 Series – Two models with a travel range of up to 5" by 5" (12.7 cm x 12.7 cm). These models feature a large, unobstructed work platform. Standard lead screw advance is 0.100"/revolution. Other finer and coarser screws are available. AXY60 Series – Three high profile models with a travel range of up to 9" by 9" (22.9 cm x 22.9 cm). These models feature a large, unobstructed work platform. Standard lead screw advance is 0.100"/revolution. Other finer and coarser screws are available. 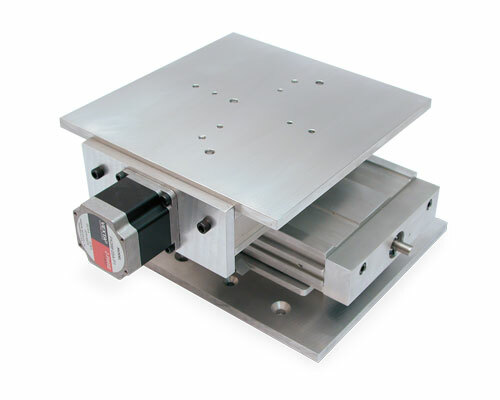 MAXY40 Series – Two medium profile models with a travel range of up to 5" by 5" (12.7 cm x 12.7 cm). These models feature a large, unobstructed work surface. Available in a variety of lead screw pitches. MAXY60 Series – Three high profile models with a travel range of up to 9" by 9" (22.9 cm x 22.9 cm). These models feature a large, unobstructed work surface. Available in a variety of lead screw pitches. 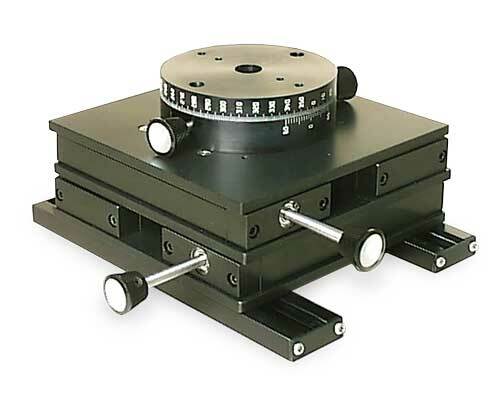 AXY25 10 0.100" W1 3/8"
AXY40 10 0.100" W1 3/8"
AXY60 10 0.100" W1 1/2"
Alternative Knobs (Manual Series only) – The knob with a crank is standard on Velmex XY Tables Series AXY40 and AXY60. 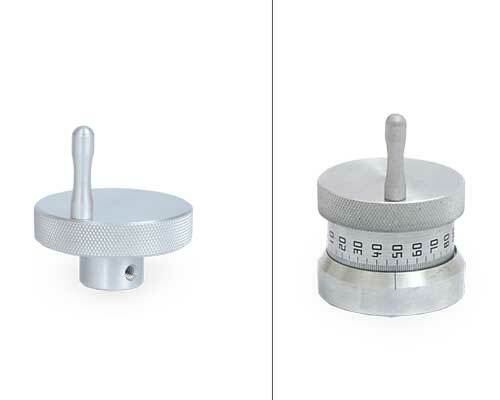 A Graduated Knob with the scale mounted on the top side of the base is available as an option on Series AXY40 and AXY60 Tables. Locks – (Manual Series only) - Are required on both axis. Revolution Counter (Manual Series Only) – A mechanical revolution counter provides a convenient 1/10 revolution increment count. Readouts in either 0.01" or 0.1 mm. 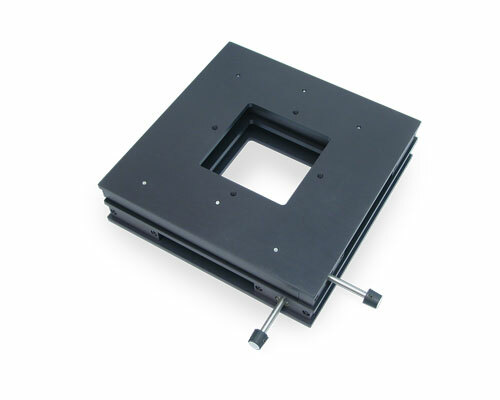 Aperture (Manual AXY25 only) – Square window through center for a variety of optical and alignment applications including microscope and laser positioning, inspection, etc. .
Encoders and VRO™ Encoder Readout (Manual or Motorized Series) – For a high resolution position readout an encoder and Velmex's VRO encoder readout can be mounted to most linear UniSlide assemblies. 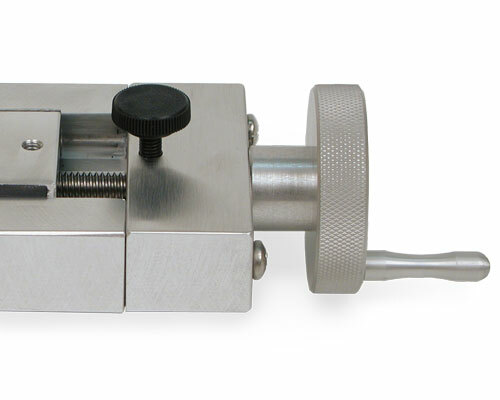 An encoder, mounted directly to the slider gives a true and accurate reading eliminating lead screw and backlash errors. 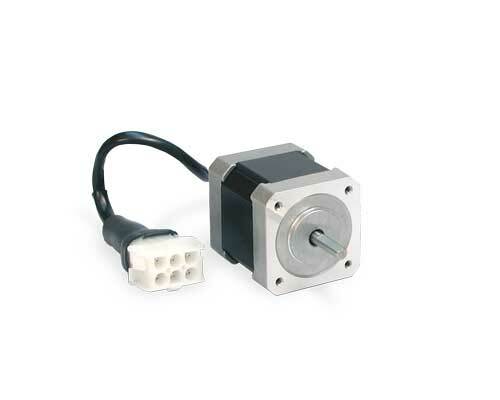 The VRO Readout is compatible with all 5V incremental encoders. It can monitor one or two axis. Fully functional, it features automatic memory back-up of settings, sleep mode and self diagnostics. It's highly visible, wide-screen LED display makes it easy to view the positioning results. (Not available on all UniSlide models.) 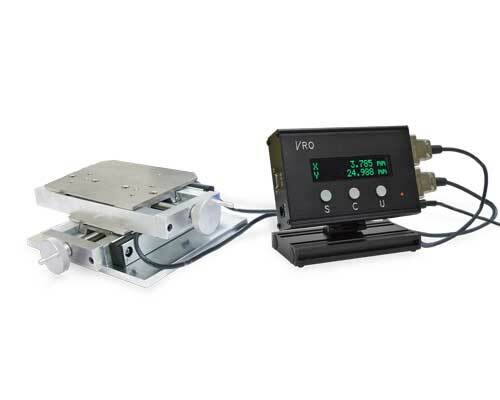 SEE: Velmex Controls on the Encoders and the VRO Readout for additional details. Limit Switches (Motorized Only) – Outboard adjustable and fixed end-of-travel limit switches are available as an option. Outboard Adjustable Limit Switches – Mounted on the side rib of Velmex UniSlide Assemblies, these switches can be used to stop travel, provide more stops than the standard two, over-travel a stop point, change speed or be active in only one direction. Fixed, End-of-travel Limit Switches – These push button switches are fixed on the side rib of Velmex Unislide Assemblies. They are not adjustable. 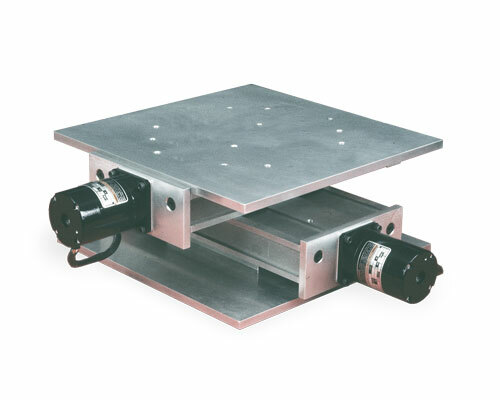 Motors – A variety of motors are available to power Velmex UniSlide Tables most popular of which is the DC step motor. 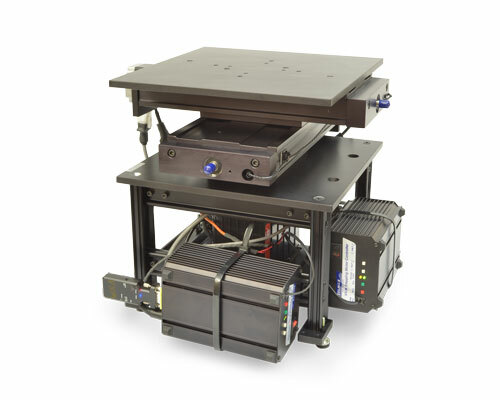 Gear motors, servo motors and high resolution step motors in both AC and DC can run Velmex UniSlide XY Tables. SEE: Velmex Controls on the Motors for additional details. 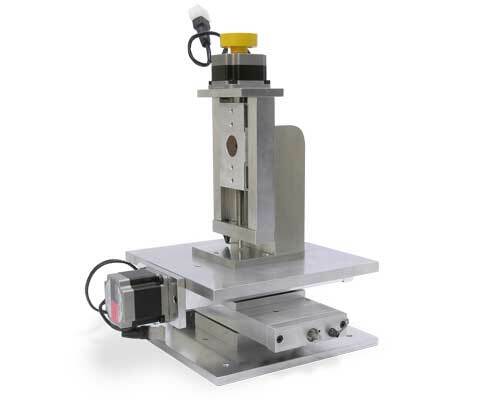 VXM™ Controller – Step motors coupled with a motor controller like the Velmex VXM™ are a cost effective solution for accurate speed and precise incremental positioning. SEE: Velmex Controls on the VXM Controller for additional details. NOTE: Lead Screw pitch variations are represented by a single drawing number. 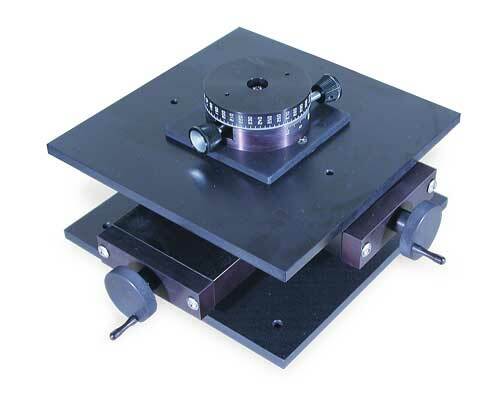 For example - AXY2506W1 becomes AXY2506XXA "W1" lead screw pitch is standard with Velmex XY Tables, although other lead screws are available. Pictured in our gallery are examples of configurations for both manual and motorized pre-assembled UniSlide XY tables. Product and accessory offering is subject to change and availability. First - always read the Users Manual. Comments can also apply to UniSlide Pre-configured XY Tables. • MA1500 Series 1 ft. lb. • MA or MB2500 Series 1 to 3 ft lbs. • MA or MB4000 Series 1 to 3 ft lbs. • MA or MB6000 Series 3 to 6 ft lbs. • MB9000 Series 3 to 6 ft lbs. 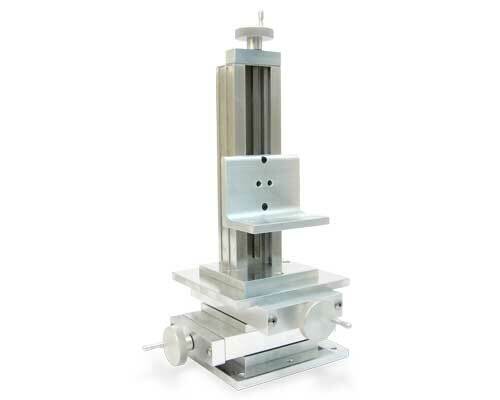 • Remount base to a flat surface. 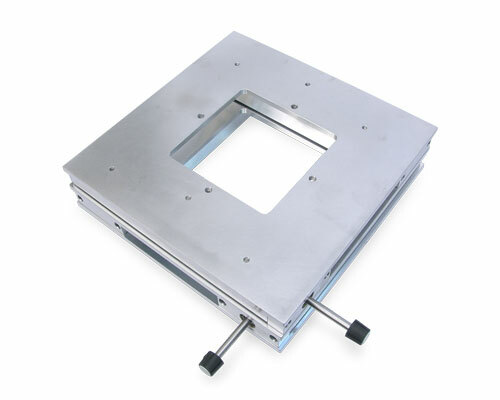 Mounting non-flat plate or blocks to the carriage to hold the load can also distort the assembly, causing carriage binding. Anything attached to the assembly must be mounted flat to the carriage. 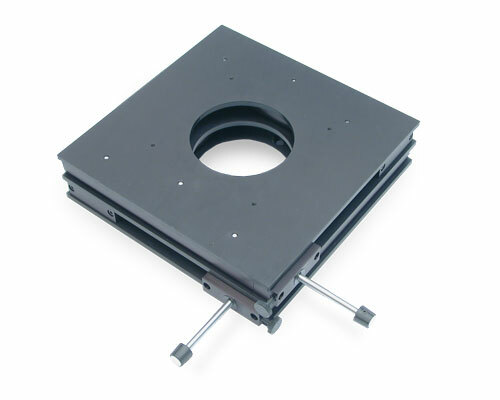 Re-mount load flat to the carriage or use a Velmex adapter plate designed to carry the load. Mounting screws holding payload to carriage may be too long and screwed into lead screw causing damage. 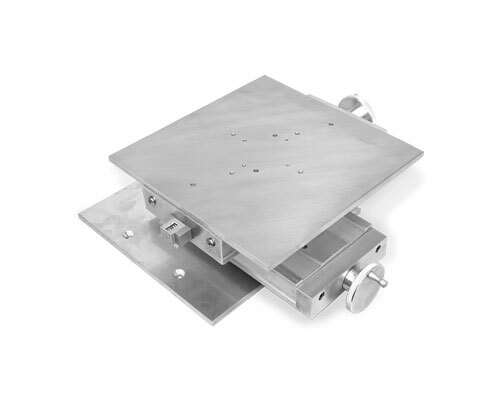 Re-mount load using a shorter screw length that does not extend past the carriage or use a Velmex adapter plate designed to carry the load. If the distortion is still present and the carriage still binds contact Velmex Application Engineers. The carriage and/or the lead screw may need to be replaced, or the Assembly may need to be returned on an RMA for repair. The limit switches do not appear to stop the carriage. 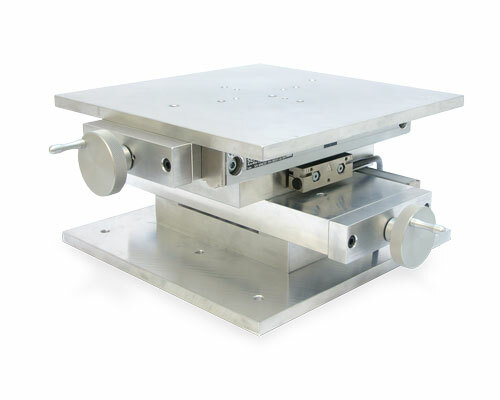 The limit switch collars must be set sufficiently distant from the ends of the Assembly to avoid collision with the end plate or limit switch cover. 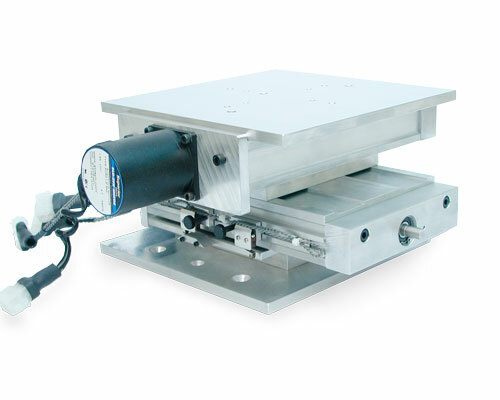 The carriage stopping distance is dependent on the speed just before limit switch activation. Set the collar position for the maximum anticipated carriage speed. What comprise Velmex Pre-Configured XY Tables? 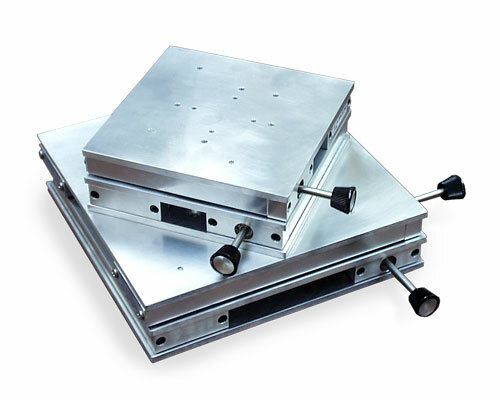 Velmex XY Tables are made of two identical Velmex world renown UniSlide® linear assemblies mounted in XY. 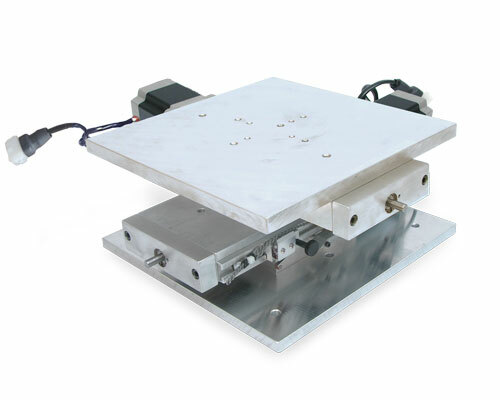 The pre-configured Tables also have a much larger payload plate and base plate. Do Velmex XY Tables use lead screws other than the "W1" with 0.100" per revolution? Yes. 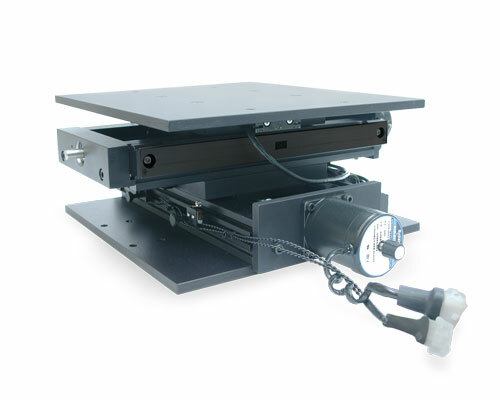 Velmex Manually-operated XY Tables are standard with the W1 lead screw. Other lead screws are available as an option. 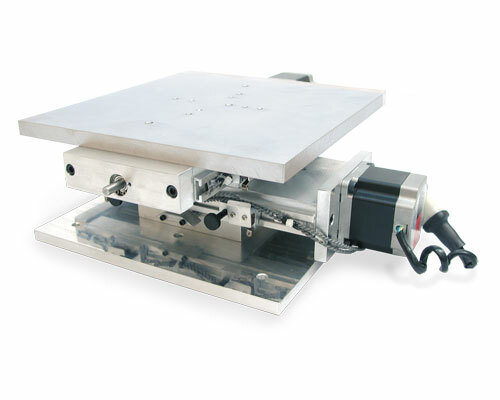 Motorized XY Tables are available with most of Velmex's standard and precision accuracy lead screws. Are there other types of XY Tables? All of Velmex UniSlide®, BiSlide® and XSlide™ linear stages can be combined to make different size XY Tables to fit most any requirement. Thousands of different combinations are possible. 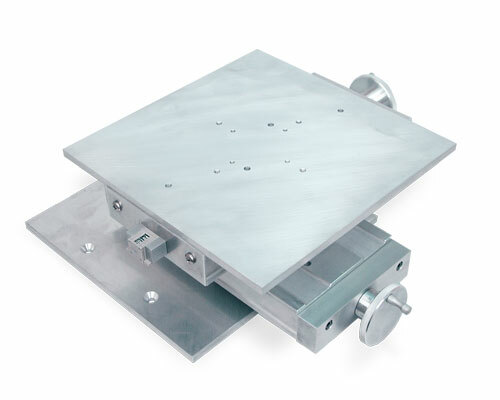 If you have questions about your specific application or want us to design system incorporating Velmex UniSlide XY Tables or another XY Table, please complete the Request Assistance form or call Velmex to speak to one of our Application Engineers.